Adriana Varella and Nilton Maltz, Digital DNA, 2005, Printed circuit boards on fiberglass and Styrofoam, Anonymous loan. BOSTON—Digital DNA, the seven-foot-tall outdoor sculpture by artists Adriana Varella and Nilton Maltz, has found a new home on the campus of Harvard Business School. Originally commissioned by the city of Palo Alto in the early 2000’s, it resided in Lytton Plaza in the center of the city until making the cross-country trek last Spring. 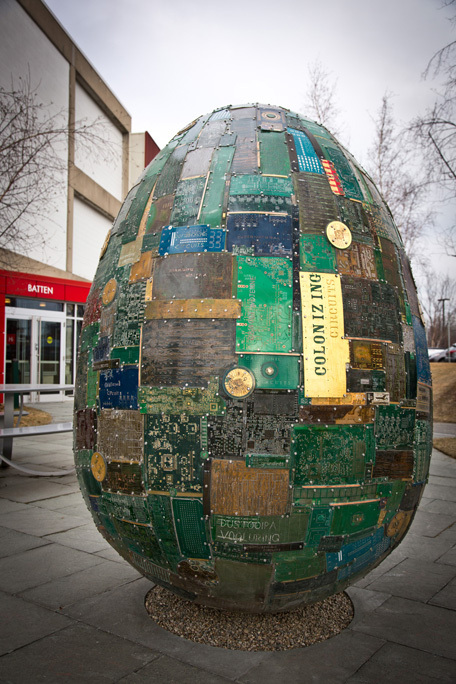 Digital DNA is a large egg-shaped form made of recycled circuit boards and fiberglass polystyrene bead foam. Many of the boards are etched with phrases crowd-sourced from people of all walks of life, who shared with Varella their thoughts about technology as the “circuits in their lives." Phrases appear in a variety of languages, and they speak to a wide variety of ways in which technology and humanity intersect. When the city decided to deaccession the work, an anonymous art collector stepped in to purchase it. It is on loan to Harvard for a five-year term. Over time in Palo Alto the piece fell into disrepair, requiring extensive treatment by Varella to make it ready for its new home outside the Harvard Innovation Lab on Western Avenue in Allston. Situated directly between the Harvard Business School and the Harvard John A. Paulson School of Engineering and Applied Sciences, the iLab is a hub of innovation open to students and faculty across the University who are interested in entrepreneurship. Digital DNA is the latest addition to the Business School’s public arts program, which features not only a permanent collection, but also an exhibition of sculptures on loan from a number of artists and institutions, all of which are on display throughout campus.